Needless to say, Facebook is rather the biggest social networking platform. It is not only used for staying connected with people, yet it has become a hub for internet advertising. Many brands as well as businesses use Facebook groups and pages to get attention of customers. Facebook pages are rather a tool for brands and businesses to connect to their customers. Therefore there are a lot of pages on Facebook that people like and follow. These pages are managed by admins, who have the right to control the page as well as publish content. If you are struggle to for Facebook likes then read our guide about how to increase likes on Facebook page. Sometimes admins have more than one page. If these pages are for the same purpose, admins would rather want to merge the pages together to engage more audience. In this way, admins can combine the likes and check ins of both pages into a single Facebook page. This decreases management work. Hence, to help admins merge their Facebook pages, we here have everything you need to know about how to merge pages on Facebook. We have provided all the required information and also the simple steps to merge Facebook pages. Part 3:- “Pages can’t be merged” Error Solution. 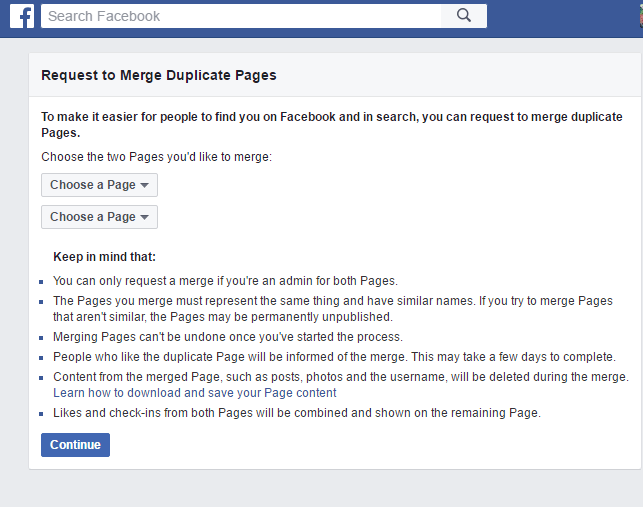 Method 2:- Request Facebook Page With Merge Error. Part 4:- Step To Merge Big Facebook Page Into Small ? Facebook merges only those pages that have similar name as well as appear to represent the same thing. Therefore, it is important to make some changes in your pages before merging them. Change the names of the pages to the same. If same isn’t possible, then make them as similar as possible. For example Safe Tricks and Safe Trick both are almost similar possible to merge. Also, update the about section with similar information. This probably may be your website, address and description. Step 3. Click on “Merge Pages”. According to Facebook page policies we can only merge pages on Facebook with similar name. So if you are trying to merge pages having different name. Then you need to do some changes. Lets suppose We have two different name page, 1st is of Safe Tricks Name and 2nd is for Pahul Singh. Now Suppose i want to merge Pahul Singh into Safe Tricks. Then we need to change Pahul Singh’s page name to Safe Tricks. For better understanding if the page name too much different then change name in 2 or 3 processes. We can adjust these name changing request according to our page name and similarity. If you want to Change Facebook Page Name Follow Below Given guide. Follow:- How To Change Name On Facebook. These Pages can’t be merged because they are too far apart. Each page can only have one place associated with it. Don’t use this tool to merge different branches of your business. If these places refer to the same place, try changing the address on the destination place and waiting for the location to update. Solution for this error is simply remove addresses from both pages before merging. Make sure to remove Map also. while merging pages. This error occurs when Facebook page admits try merging more than 5 or 6 pages. Then, Facebook restricts automatic merging. Therefore, to solve this error you can try two methods. Below given are the methods to solve the “pages can’t be merged” error. 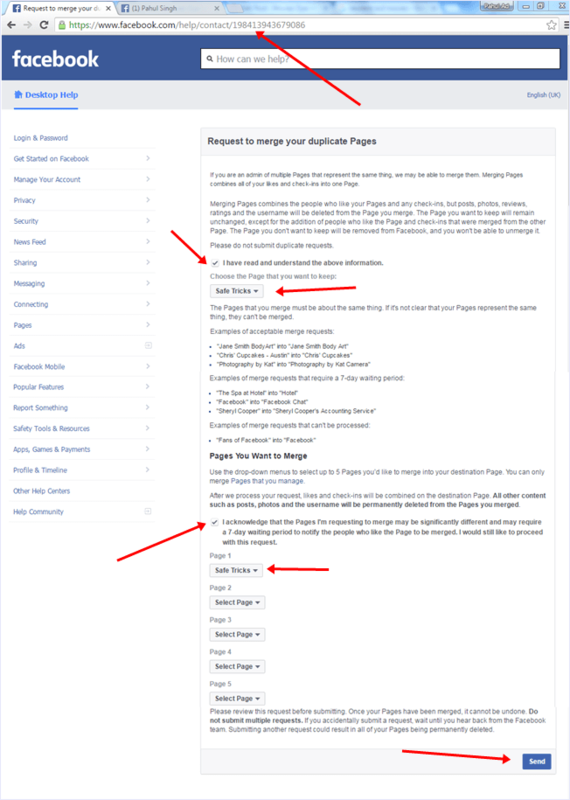 If you want to merge pages on Facebook at huge level then you can follow the given guidelines below. The best way to merge many Facebook pages it that you pair up Facebook pages with very similar number of likes in a successive way. For example, two pages with 10k likes can be merged together. Then the resulting page has 20k likes. Thus, this page can be merged with another page with 20k likes, and so on. The next method is very effective in removing the “Pages can’t be merged” error. Hence, it is a premium method. This method rather requires you to fill a form for manual merging of Facebook pages. We have given the link for the form below. Yet it is not very easy. Note:- Above given form is not publicly available. Its only available for few account. To access this form you need to perform little task. We have done this just to reduce bogus request on form. We have explained whole process in document file you will receive from above link. If you want merge page with more likes into less or 0 like page. Then their is no need to proceed for any other way. Above given Facebook request form. In conclusion, we hope that this easy guide on how to merge pages on Facebook will help you. We do our best to explain to processes and ways related to merge Facebook pages. For any assistance or query, feel free to write to us in comments below.